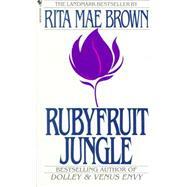 ...écrit RITA MAE BROWN dans "RUBYFRUIT JUNGLE" p.48 de l’édition Penguin à 5£99. "That week I thought of how to ask Leota to marry me. I’d die in front of her and ask her in my last breath. If she said yes, I’d miraculously recover. I’d send her a note on colored paper with a white dove. I’d ride over to her house on Barry Aldridge’s horse, sing her a song like in the movies, then she’d get on the back of the horse and we’d ride off into the sunset. None of them seemed right so I decided to come straight out and ask. Next Monday after school Leroy, Leota, and I were walking home. I gave Leroy a dime and told him to go on ahead to Mrs. Hershener’s for an ice cream. He offered no resistance as his stomach always came first. "Leota, you thought about getting married ?" "Yeah, I’ll get married and have six children and wear an apron like my mother, only my husband will be handsome." "Who you gonna marry ? " "Why don’t you marry me ? I’m not handsome, but I’m pretty." "It’s a dumb rule. Anyway, you like me better than anybody, don’t you ? I like you better than anybody." "I like you best, but I still think girls can’t get married." "Look, if we want to get married, we can get married. It don’t matter what anybody says. Besides Leroy and I are running away to be famous actors. We’ll have lots of money and clothes and we can do what we want. Nobody dares tell you what to do if you’re famous. Now ain’t that a lot better than sitting around here with an apron on ?" "Good. Then let’s kiss like in the movies and we’ll be engaged." We threw our arms around each other and kissed. My stomach felt funny. "Does your stomach feel strange ?" We kissed again and my stomach felt worse. After that, Leota and I went off by ourselves each day after school. Somehow we knew enough not to go around kissing in front of everyone, so we went into the woods and kissed until it was time to go home." Cet article a été publié la première fois le 09 novembre 2008. C’est dingue d’imaginer que maintenant, son titre n’est plus valable en France, non ? ..et elles se sont mariées à la fin ? Il faut lire le bouquin Yu !!! Crois-moi, tu ne perdras pas ton temps !